When I was at the Niobrara Valley Preserve a couple weeks ago, I spent some time exploring the area north of the river where the 2012 wildfire ripped through oak savanna and ponderosa pine woodland. 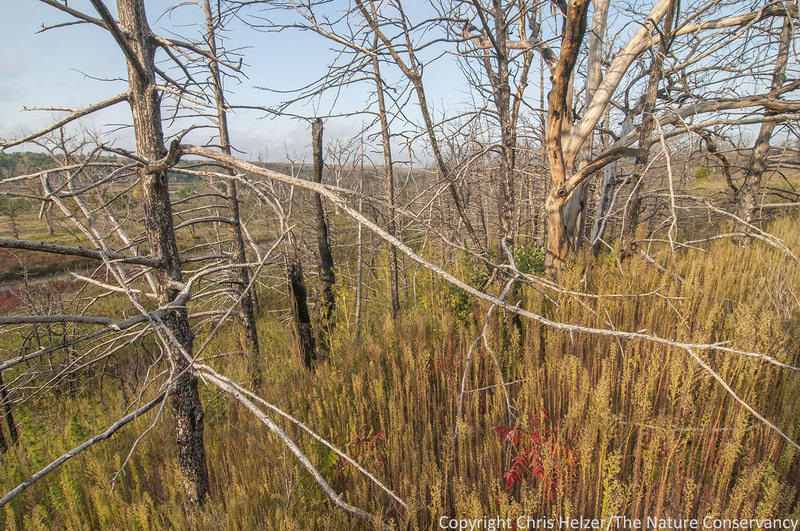 As discussed in earlier posts, the density of trees, especially eastern redcedar, fueled a fire that killed nearly every pine and cedar in the 3000 acres of Preserve land on the north side of the river. Most oaks and other decidous trees were topkilled, but many resprouted within a few weeks of the fire. I have been following the regrowth and recovery of this part of the Preserve with great interest, and trying to help the Preserve staff as they think about how to manage the area in the future. Here is a series of photos from an uphill hike I took on September 18. The photos are roughly in order of elevation, starting at the river road (just above the floodplain) and proceeding upslope to the ridgetop at the north edge of the valley. 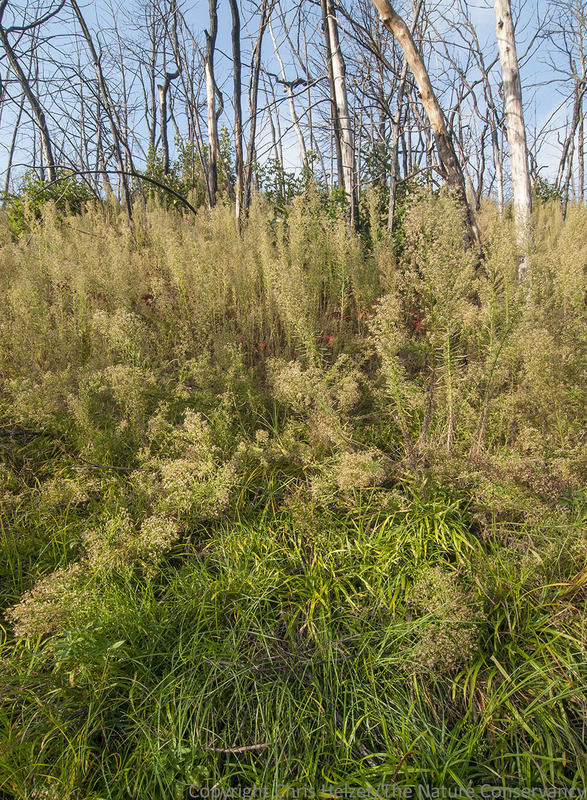 On the first slopes above the river road, hemp (Cannabis) and marestail (Conyza) dominate the understory of a woodland that now consists mainly of skeletons of eastern redcedar and oak trees. Most of the oaks have resprouts from their bases, however, and a few still have live branches up high. The abundance of marestail (a native pioneering species) is especially interesting to me because it’s the same species that usually dominates two-year-old prairie plantings. This is the role it plays in ecosystems, and it plays it well. It’s difficult to see very much below the marestail, but when I looked closely, I found scattered grasses, sedges, and wildflowers – a good sign of future recovery. 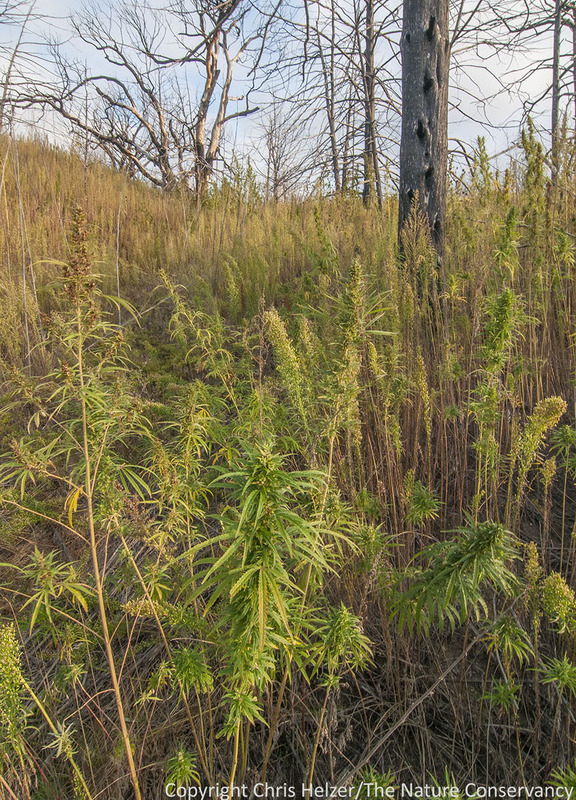 As I walked higher and got into the prairie-covered slopes, ragweed (Ambrosia) replaced marestail as the visually dominant plant in the formerly shaded areas beneath cedar trees. The ragweed is playing the same role as the marestail – quickly filling in the open space until a more permanent plant community establishes. That community should move in pretty quickly in cases like that shown in this photo, in which a cedar tree is surrounded by prairie. 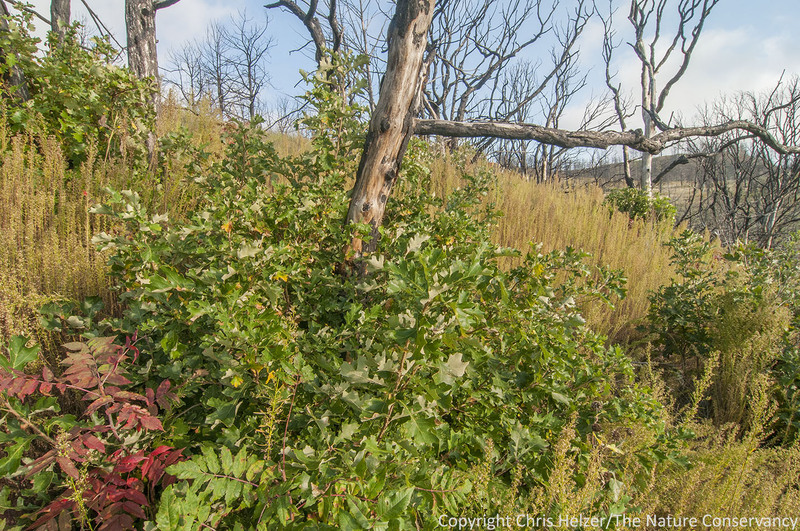 Higher up the slope, large areas of prairie had not been encroached upon by cedars, and recovery after the fire was just as predicted – quick and easy. The vegetation was still a little thin, but that was more of an aftereffect of the 2012 drought than of the fire. In this image you can see the scattered cedars further downslope (such as the one featured in the previous photo). I was surprised and pleased to see numerous examples of large sedge patches growing under the marestail forest, especially on the steeper portions of draws. I don’t remember seeing many sedges last year, so either I missed them or they are expanding rapidly. Either way, they will sure help stabilize those slopes as other plants move in to join them, and they’ll also help carry fire when we restart fire management of the area. High on the slopes, where ponderosa pine and eastern redcedar had dominated just a few years ago, the scenery was every bit as spectacular as it had been before the fire – just different. Marestail was abundant here too, but there was quite a bit of grass and wildflower cover as well, and several shrub species were flourishing, including smooth and skunkbush sumac, chokecherry, snowberry and others. Despite the density of scorched tree trunks, the overall feel of the slopes was not one of death and destruction, but rather of abundant life. Even the very steep erodible slopes at the very edge of the ridge top were full of previously established perennial wildflowers and shrubs, as well as colonizing annuals. 1) Invasive plants would fill the slopes before the native vegetation could recover, and we’d be faced with the difficult challenge of attacking those invasives in difficult terrain. 2) Numerous eastern redcedar trees would colonize the slopes before there was enough vegetation to carry prescribed fires to knock those cedars back. 3) Soil erosion would be so severe that the seed bank needed to reestablish the native plant community would wash down the slope, along with the topsoil those plants needed to grow. None of those three have occurred – or at least to the extent I feared they might. There has been some erosion, but much less than I anticipated, and it doesn’t seem to be affecting vegetation recovery much. I haven’t seen any truly invasive plants yet – which doesn’t mean they aren’t there, but they sure aren’t roaring in. Finally, the recovery of the vegetation has been fast enough that we should be able to start running prescribed fires up the slopes within the next few years. I didn’t see any little cedar trees on my walk, and while I’m sure there are a few around, the abundance is much less than I feared, and our ability to use prescribed fire should make it fairly easy to control them, except on the steepest slopes. 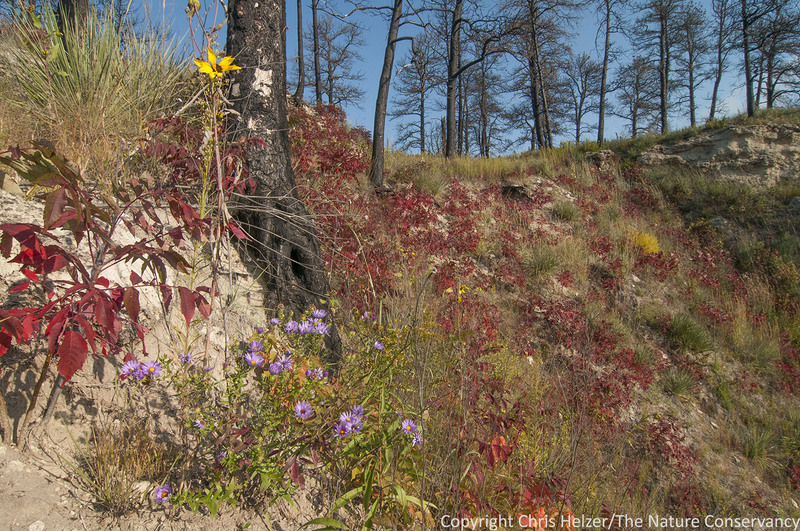 Most of all, the beauty of the Niobrara Valley has survived the wildfire. The pines are gone from some parts of the valley, but are still doing well in other areas nearby, including other parts of the Niobrara Valley Preserve. Whether or not (or when) they’ll return to the site of the 2012 fire is still an open question. Regardless, there is abundant life on the slopes north of the river. Just because those slopes will be dominated by different species than before doesn’t change the scenic or ecological value of the site. It’s still one of my favorite places on earth. 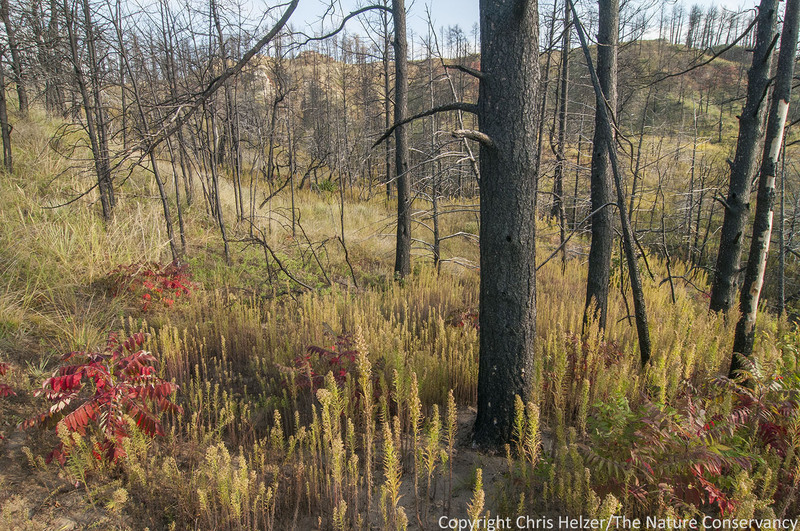 This entry was posted in Prairie Management, Prairie Natural History and tagged aftermath, fire, nebraska, niobrara river, niobrara valley, niobrara valley preserve, recovery, regrowth, weeds, wildfire, wildfire recovery by Chris Helzer. Bookmark the permalink. I’m afraid that even with my Flonase and Allegra, I would be sneezing and wheezing my way back down the slope. :) Who on earth named Ragweed “Ambrosia”?? I still would have rather had the ponderosas. It appears the bison were not helping get rid of your cedars. Without wolves there was likely no incentive for the bison to seek out cover. If they don’t go into the trees then they wouldn’t have an impact. We have seen almost identical response following wildfires in Redberry juniper invaded rangelands in West Central Texas. The grasslands respond after next rain. Areas with crownfired juniper colonize with annual forbs and take up to six years for grasses to dominate again. We have seen a slight increase in King Ranch blustem but not enough to worry about. Great pictures! 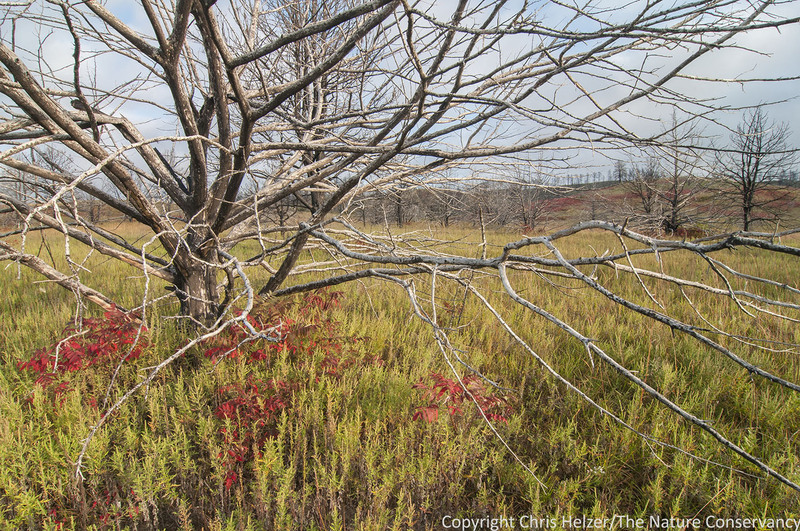 Some pictures show quite a bit of sumac…admittedly quite pretty in the fall. 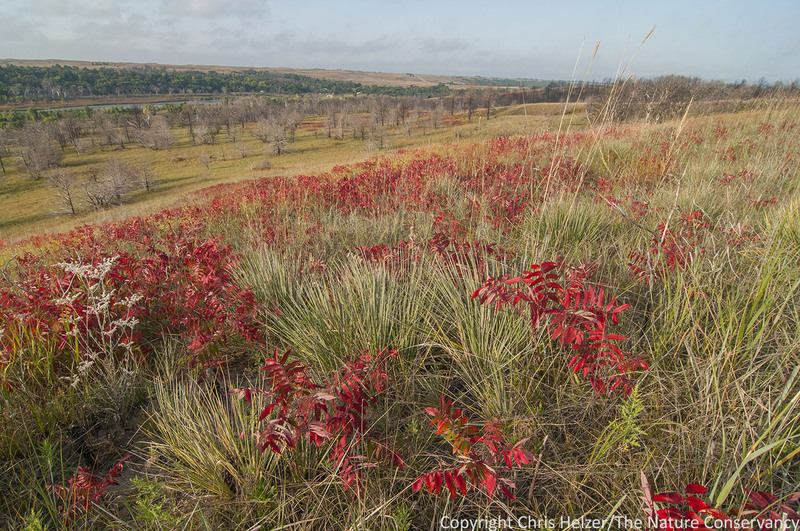 Are you worried about large sumac clones overtaking parts of the prairie? If so, have you decided on any particular management strategies? The sumac is certainly something we’re thinking about. The scale of the Preserve is such that big clones of sumac are usually not considered much of a problem, but on that formerly wooded area, my concern with sumac is that the clones could get large and mature enough that they would suppress fire (including from our prescribed fires) which could allow establishment of taller trees, including cedars. We’re talking about trying to run fires through that area before the sumac clones reach that kind of maturity, but no decisions have been made yet. It’s a tricky situation… I don’t think we’ll be able to run fires through there often enough (every 1-2 years) to really suppress sumac, and as seen in my recent Konza report, less frequent fires could actually speed the invasion… Not sure what the best plan is yet – still discussing! I also had a question about when you thought the cedars became widely established in NVP. Did they become established during a cattle grazing regime, or after bison were reintroduced? Judging by the age of the cedars, I suspect the former is true. From my own experience after a burn, I have not seen much cedar invasion in re-established prairie that isn’t grazed, possibly because of the heavy competition from grasses. Have you considered creating an exclusion zone to compare the rate of cedar invasion on grazed versus ungrazed plots following fire? The area shown in these photos – north of the river – is outside the area grazed by bison on the preserve, so it doesn’t get the benefit of bison helping to suppress cedar encroachment. I’m not aware of any research that shows that grazing by cattle has much impact on cedar invasion, but it’s sure possible that thatch and strong grass competition would slow establishment. I like the idea of exclosures to compare grazed/ungrazed… I’ll think about that. Chris- there are studies from Texas, Oklahoma and Kansas that suggests that cattle grazing does not facilitate cedar encroachment– in fact, if anything there is a slight negative impact on establishment, through it is negligible. All in all, I would say that the greatest impact of any type of herbivore on cedar encroachment is the reduction in fuel. Excellent – thanks for chiming in, Sam! As usual this is a great post. Thanks so much for sharing your perspective (both visual and cerebral) with us. My curiosity is piqued – why do you think the system is bouncing back so well? It seems that the sandhills/Niobrara system is relatively intact, especially in comparison to Iowa, where the majority of the state is in a non-native condition. I suspect the overall integrity of the system is a major reason for the resiliency. Might it also be that good stewardship by the staff and cooperators with TNC have helped the system rebound? Finally, I would think that this system has previously experienced what we today might call ‘catastrophic’ fires and is ‘programmed’ to respond. Is the Ambrosia you see colonizing primarily A. psilostachya or are you also seeing A. artemisiifolia? In our system it would be primarily Ambpsi. Chad, undoubtedly, it’s the great management by TNC staff up there that have made the system bounce back so well! Actually, I think the relative unfragmented nature of the site and the sandy/steep soils help keep the number and aggressiveness of potential invasive species down. Not having aggressive invaders allows the native colonizing plants to do their jobs at their own pace. And, I’m sure there have been catastrophic fires in the past as well, though reading that history is pretty tough. With more frequent fires – prior to European settlement – you’d hope the pine/cedar density wouldn’t have reached what it was prior to the 2012 fire, but we sure can’t say it NEVER did. Mostly Ambpsi, but some of both. Very interesting post for sure; the resilience of the prairie is remarkable. I came to truly appreciate the tallgrass prairie ecosystem during my years with the OK Chapter of TNC and time at the Tallgrass Prairie Preserve. Thank you for your great insights about the changes at Niobrara.